As anyone in my family will confirm with great exasperation, I am the World’s Most Indecisive Human Being, and it’s a title I wear with great pride (sadly, there’s no badge to go with it, but to be fair, if there were, I probably wouldn’t be able to decide whether I’d want it in silver or gold). Whether I’m taking a half hour to peruse the menu at a restaurant, weighing the particular merits of seeing one film over another, or considering at length which outfit to don, I know there are always options. …Usually too many of them. The struggle is so real, people. So when I heard this — that there are always options — trumpeted on Happier with Gretchen Rubin (a favorite podcast of mine) as a piece of advice, I thought, You don’t need to tell me that. …Except when you do, because I feel that there aren’t any options. Sometimes there are things we have to do. And sometimes the things we have to do are the matters in which we feel we don’t have a choice. They’re the things that make us feel stuck. But there is always a choice. 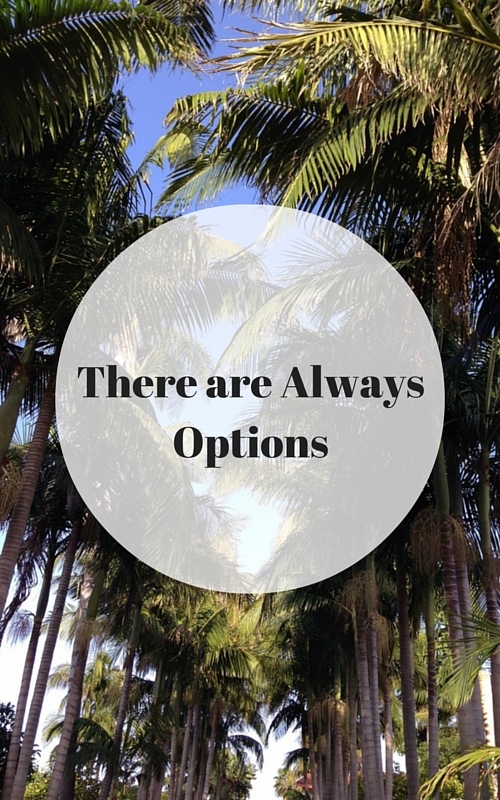 And there are always options. You might have something you have to do, but guess what? You still get to choose. You still get to decide whether you approach a situation you feel you have no control over with a smile or a scowl. With gratitude or grumbling. With positivity or pessimism. And if you feel stuck in something you don’t actually have to do, there are options there, too. Maybe it’s not feasible to switch careers right now, for example. But if you feel dissatisfied in your current job, know that there are always other options of how to fill your time outside of work in ways that are more meaningful to you. Or maybe you feel stuck in a group of toxic friends. There are endless options via apps like Meetup, community organizations to find involvement and fulfillment in, or classes for a skill you’re interested in pursuing, that can serve as vehicles for bringing different people into your life. Or maybe you just feel trapped in an ordinary routine. There are options there, too. Get outside. Go for a field trip to an art museum or a park or a cafe in your hometown. Take yourself to the movies or to the theatre. Volunteer somewhere.